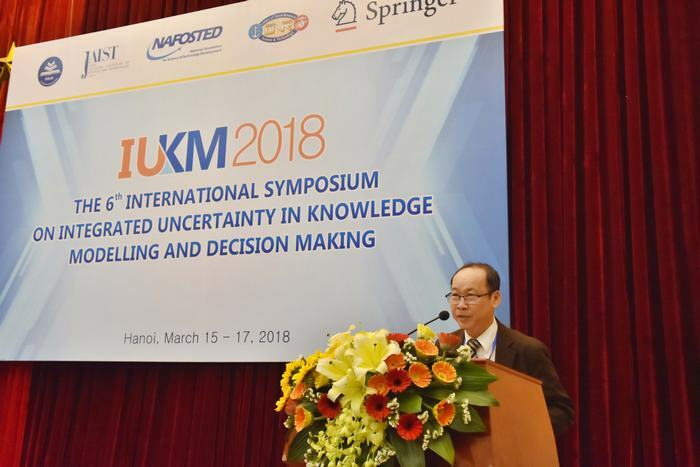 From March 15 to March 17, 1818, at Hanoi National University of Education was the International Symposium on Integrated Uncertainty in Knowledge Modeling and International Decision Making and Decision Making - IUKM 2018. The conference was jointly organized by Hanoi National University of Education and Japan Advanced Institute of Science and Technology (JAIST). Attending the conference were Prof.Dr. Do Viet Hung – Vice President of Ha Noi National University of Education; many lecturers form Faculty of Information Technology of Ha Noi National University of Education; with researchers from organizations and universities in and outside the country such as University of Tokyo - Japan; JAIST Institute; Tokyo Institute of Technology - Japan; US Air Force Laboratory; Chiang Mai University - Thailand; Chulalongkorn University - Thailand; University of Technology - VNU Hanoi; Information Technology Institute; Ton Duc Thang University; Military technical academies, ... with more than 150 participants, including 50 delegates from all over the world. The conference has 38 reports from 9 countries around the world and is divided into 10 sessions. These reports were selected from the 78 papers submitted to the Conference previously, each was reviewed by at least three experts. In particular, the conference included five invited presentations of speakers who are reputable scientists in the field of Information Technology: GS. Hiroshi Mamitsuka (Kyoto University); Prof. Phan Dao (U.S. Air Force Research Laboratory); GS.PedjaNeskovic (Office of Naval Research, USA); Michio Sugeno (Tokyo Institute of Technology); Prof. Qiang Ye (Harbin Institute of Technology, China). In addition, one day before the meeting, three lecturers presented lectures on a number of topics in Information Technology for lecturers and graduates in Information Technology. Conference reports focused on the following topics: modeling uncertainty and conflict in large datasets; Information summarization and knowledge integration in an uncertain environment; Decision support when information is uncertain; Machine learning and application in economics and molecular biology; Intelligent data modeling and analysis, fuzzy logic and applications, ... Proceedings of the conference were published by Springer ISBN: 978-3-319-75428-4 in the LNAI series and was online at http://www.springer.com/gp/book/9783319754284. Through the presentations, the conference brought participants the opportunity to acquire the academic knowledge, exchange and share experiences among research groups in the world; networking experience between research organizations; experience in scientific research motivation. At the same time, a conference is also a place for young researchers to present creative ideas as well as research results and research in the fields of information technology and other related fields. In the framework of the conference, at the Gala dinner on the evening of March 16, 1818, Prof. Dr. Nguyen Van Minh - President of the Ha Noi National University of Education expressed his congratulations to the successful conference and thanked the foreign and local scientists, who participated in the IUKM 2018 conference. At the same time, on behalf of the Ha Noi National University of Education, the program's representatives and organizers, Prof. Nguyen Van Minh also presented the souvenirs to Professors for these invited presentations. At the end of the conference, Assoc.Prof.Dr. Dang Dang Hong - Dean of Faculty of Information Technology, Hanoi National University of Education, Head of the Organizing Committee, thanked the local and foreign scientists for their participation and contribution to the conference, the staff of Hanoi National University of Education and JAIST Institute for their efforts to make the conference a success.